A gas pressure gauge is seen at a snow-covered transit point on the main pipeline from Russia in the village of Boyarka, near Kiev, Ukraine, on Tuesday. Russia's Gazprom state gas monopoly resumed pumping gas to Europe via Ukraine Tuesday after a six-day cutoff that left large parts of Europe cold and dark. The company turned on the taps after 10 a.m. Moscow times (0700 GMT), Gazprom spokesman Boris Sapozhnikov said by telephone from Sudzha gas metering station on the border with Ukraine. European Union officials said it would take at least a day for gas to reach consumers in Europe after gas is first pumped into Ukraine. Russia has accused Ukraine of stealing gas intended for Europe and only restarted supplies after a EU-led monitoring mission was deployed to gas metering and compressor stations across Ukrainian territory. The observer mission includes EU, Russian and Ukrainian officials and representatives of European energy companies. Ukraine fiercely denied the siphoning charge, but Prime Minister Yulia Tymoshenko warned Monday Ukraine will have to use some gas from Russia as so-called "technical gas" to power compressors that push Europe-bound gas through its 23,000 miles (37,800 kilometers) of pipelines. Gazprom has insisted it's Ukraine's duty to provide the gas, setting the stage for more bickering and possible supply interruptions. Russia's President Dmitry Medvedev already has ordered Gazprom to reduce supplies if it again sees Ukraine siphoning gas, and suspend it completely if it believes Ukraine continuously steals gas. Ukraine's position potentially "creates a crisis situation with the transit of Russian gas to European users," Gazprom spokesman Sergei Kupriyanov said in a statement late Monday. Russia supplies about one-quarter of the EU's natural gas, 80 percent of it shipped through Ukraine, and the disruption came as the continent was gripped by freezing temperatures in which at least 11 people have frozen to death. The gas cutoff has affected more than 15 countries, with Bosnia, Bulgaria, the Czech Republic, Hungary, Serbia and Slovakia among the worst hit. Sales of electric heaters have soared and thousands of businesses in eastern Europe have been forced to cut production or even shut down. Russia stopped gas supplies to Ukraine on Jan. 1 amid a contract dispute, but continued sending gas to Europe across the Ukrainian territory until Jan. 7 when it fully halted shipments over alleged Ukrainian theft. Russia used the gas dispute to reaffirm its push for prospective gas pipelines under the Baltic and the Black Sea which would bypass Ukraine. But EU officials said the crisis should encourage a search for independent energy sources and supply routes, such as the U.S.-backed Nabucco pipeline that would carry Caspian energy resources circumventing Russia. While the current gas crisis was triggered by a pricing dispute, relations between the two ex-Soviet neighbors have been strained since the 2004 Orange Revolution in Ukraine led to the election of a pro-Western government in Kiev. Ukraine's efforts to join NATO and its support for the former Soviet republic of Georgia in its war with Russia in August has angered the Kremlin. Last week, U.S. officials had warned Russia not to use its energy resources as a weapon against Europe. 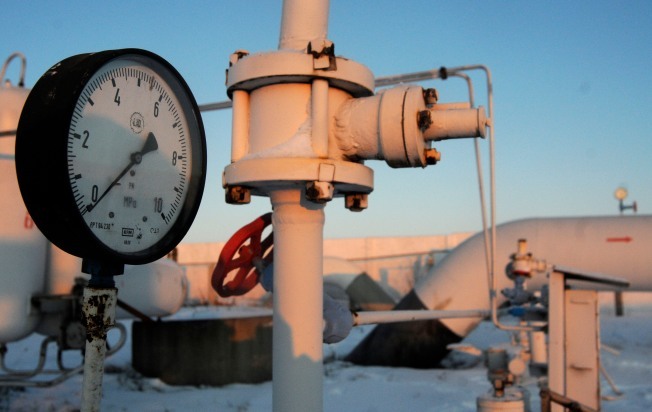 Russia still will not send natural gas to Ukraine for domestic consumption. The neighbors remained deadlocked over the price Ukraine should pay for gas in 2009 and the amount Russia should pay for transporting gas through Ukraine. Ukraine in 2008 paid $179.50 per 1,000 cubic meters of Russian gas and turned down Gazprom's proposal of $250 for 2009 — a substantial hike for the economically distressed country but still far below some $450 that European customers pay. The latest round of price talks ended Sunday without result.